This compact hydraulic gauge is designed primarily for occasional force checks. 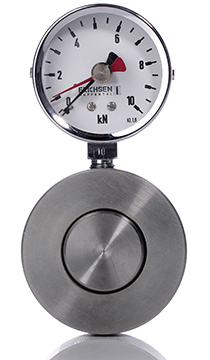 This compact hydraulic force gauge from Erichsen Wuppertal is designed primarily for occasional force checks and field service, rather than continuous loading. The force gauge offers compensation on surfaces that are not straight and the display units in 63 mm diameter have a maximum reading pointer.